A to Z glazing now supply and fit purpose made screensto prevent insect from entering areas where standards of hygine are important.THese screens are available as fixtures side or top hung or as a roller blind in its own frame.Suitable for school kitchens etc ., Prices are subject to site survey . A to Z glazing now supply a range of polycarbonate and stainless steel mirrors , highly suited for schools , hospitals and the prison service. A to Z glazing are specialist in installing all types of 'Pyro Glass ' A to Z glazing also supply and fit Mirrors, Double Glazed sealed units and armour plate doors. Toughened glass , Laminated glass and all types of safety glass. A to Z Glazing are top of the field when it comes to Frameless Glass Doors, Armourplate Glass Doors and toughened safety glass. Supplying and installing Frameless glass doors throughout the Uk in a wide selection of commercial buildings. A to Z glazing are often called upon to supply their expertise in rectifying problems where others have fitted Frameless glass doors with poor results. A to Z Glazing also supply and hold stocks of various fittings from the leading manufacturers to suit frameless glass doors, including floor springs, patch fittings, rails and handles. 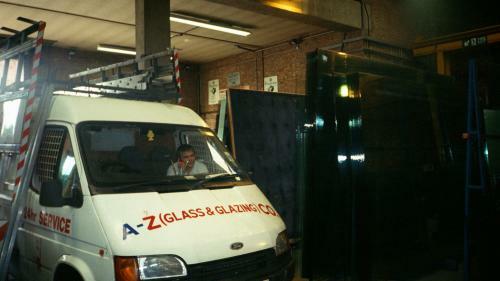 I would like to thank all at A to Z glass for their excellent service from start to finish. It was what I call the old fashioned service , very hard to come by these days . Terms: This offer is not available to other Glazing Companies which already buy from us. Glass removal is like for like and only on conclusion of a firm order. The offer does no apply to frameless glass doors over 12mm in thickness. Clear Glass Only. You must mention Scoot at the time of placing your enquiry. Only one offer can be redeemed per contract. A to Z Glazings Standard 'Terms and Conditions' apply. A copy is available on request.